A storm was brewing up in the evening sky, but it wasn't looking exactly threatening until midnight. 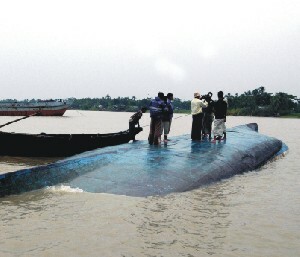 At around 2.30am when the launch entered into the Meghna the so-far weak storm accompanied by light rains suddenly picked up great pace and turned into a terrible twister. The frightened master took the launch by a sunken char called Lagnipara and cast anchor. After some 15 to 20 minutes when the twister waned a bit the launched resume its voyage. When the launch was back in mid-river once again the twister made a sudden come back. Waves swelled into mountainous proportion and thrashed on the launch and it began to swirl sideways dangerously before it finally began sinking. According to eyewitnesses who narrowly escaped a watery burial, some 70 to 80 passengers dived into the river when the launch was drowning. The screams for help from the passengers, though weakened by the whistling sound of the twister, still reached the riverside village Bishnudi. Thinking they had been attacked by robbers the villagers came out from homes with torch and sticks in their hands, but soon realised what was happening. Not all of them who jumped from the drowning launch into the wild, ferocious river, could make it to the shore. Eighty one men, women and children perished with more than twenty missing persons who are feared to be dead.